Emailing you as to how you can claim your tickets! Thank you! 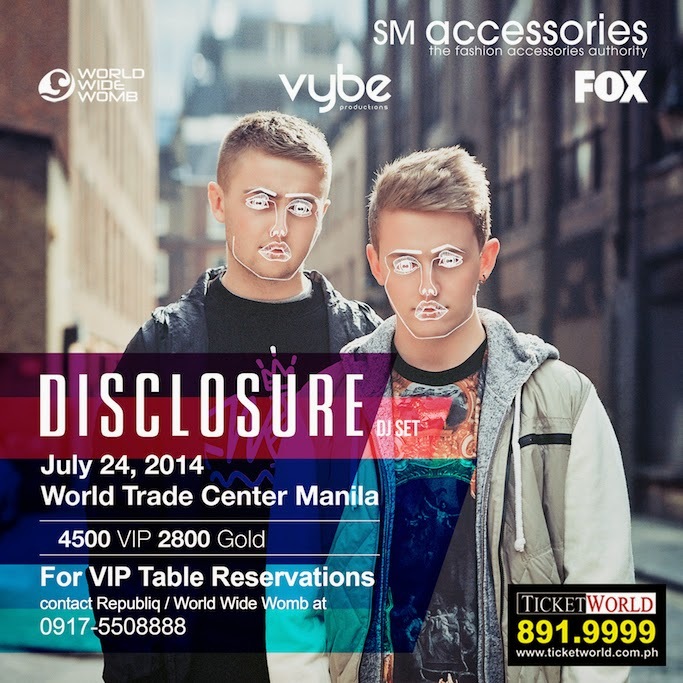 SM Accessories brings English electronic music duo Disclosure to perform live in Manila! Get ready for July 24, and party with EDM lovers at the World Trade Center! 3) Tweet OR Instagram the POSTER above with the caption: "Party with Disclosure! Win 2 GOLD tickets here: www.anagonzales.com #SMAccessoriesxDisclosure"
4) Comment below with your full name, email, and link of your post. I will post the winner by July 22. Good luck! Can't wait to see Disclosure and surprise my girlfriend! Best of luck to everyone!! Im dying to watch DISCLOSURE!!!! Let me win pleaaaaaase!